The garbage in the area of Seminyak Beach, Legian, Kuta during the period of December 22, 2013 until January 15, 2014, in total have reached more than 1,000 tons. The garbage continues to pile up along the coast, the worst is in Kuta. According to the Head of the Rapid Reaction Unit (URC) Badung Sanitation and Gardening Department (DKP) Made Gede Dwipayana, the volume of waste has increased every day. Even the increase reached 200 percent every day. “If since its coming it was 10 tons every day. But now it rises 200 percent, so the average is about 30 tons of waste transported per day,” said Dwipayana. He added that the garbage piled up to about 30 tons per day spread not only in Kuta area, but also along Legian Beach and Seminyak. “If we make the total, we have transported more than 1,000 tons from December to January,” he said. It is estimated that the brunt of garbage will still happen until February and mid March. Therefore, the URC team of DKP Badung will continue to deploy 21 personnel on standby to back up hygiene personnel in Kuta. The withdrawal of URC personnel will be done if the beach is back to normal conditions. 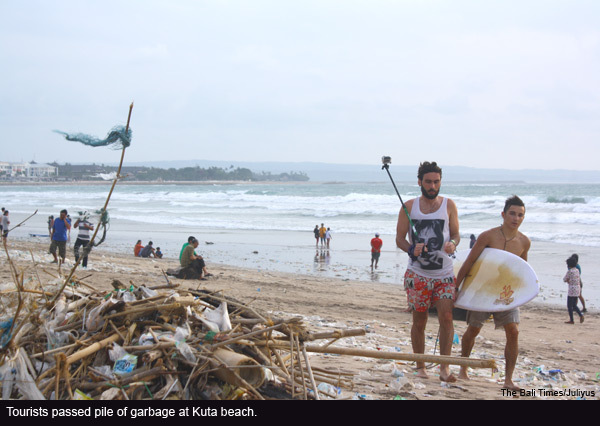 Previously, rubbish in the Kuta area in particular has been highlighted by a number of tourists. Travelers are amazed at the piles of garbage on the beach, especially tourists who had their first time to Bali. Chief of Kuta Beach Task Force I Gusti Ngurah Ngurah Tresna recently said most of the visitors who’ve been and living in Bali can tolerate this condition. “It’s called a natural phenomenon. The most important thing is how the cleaners from DKP Badung and others can swiftly prepare personnel and operational equipment, so that the pile of garbage can be quickly cleaned up,” he said. Garbage in Kuta beach is very pathetic. Although visitors understand it, but also many visitors are disappointed to see the sights of garbage. They visit to Bali to see the beauty of the beaches in Bali, not junk. If only the Bali’s government is more concerned and firmly to the visitors, in fact we could have to minimize the garbage. Moreover Kuta beach is one of the most popular beaches in Bali, so the government and the visitors should really maintain the cleanliness and the beauty of beach. No, I am not putting the blame solely on the Balinese people because much of the blame goes to the people from Java. My suggestion is that a large incinerator be built North of Seminyak Beach, Legian and Kuta. All the plastic bottles and plastic bags, timber, trees etc. could be incinerated under great heat that could be used for alternative purposes. The residue of the incineration can be utilised as fertiliser. This procedure is used in many European countries. When will Indonesian citizens learn that they can’t throw their garbage in the rivers and on ground? Is it possible? Are they smart enough? Why doesn’t the government educate its people????? Do they care that their country is turning into a garbage dump? Indonesia is the most beautiful country, why dont the people care about their country???? I agree with you. The government should take seriously the problem of garbage on the beaches of Bali if they want to attract tourists to Bali. Every second year I come as a tourist to Bali South. and more for one night, tourist will switch again to Thailand or Malaysia. Bali people will loose a lot of money if they do not handle the problem just now, otherwise it will be really to late,beleave me. I was there last december 2013, the rubbish was a huge problem around Kuta, ubud, seminyak, legian etc. Despite of ten thousands of domestic tourist& foreigners tourist. Bali government & businesses, they have earned high income from tourism. I have noticed that no improvement or progress in keeping these places clean, tidy or hygienic. The mountains of rubbish were everywhere, so disgusting & sickening for tourists who payed lots money the flight & the hotel to get into the holiday place paradise. No wonder lots of tourist got sick after visiting Bali.